Summary: This simple, gorgeous sorbet really takes only 5 minutes, and that's including clean up! And it goes fabulously under Deep Dark Delicious Raw Chocolate Sauce (which also takes less than five minues to make!)! A complete dessert in only ten minutes! 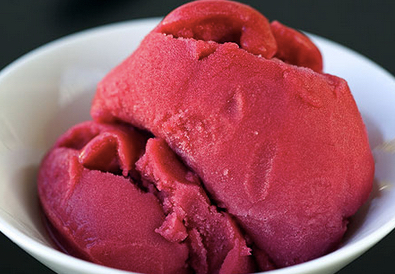 This simple, gorgeous sorbet really takes only 5 minutes, and that’s including clean up! And it goes fabulously under Deep Dark Delicious Raw Chocolate Sauce (which also takes less than five minues to make!)! A complete dessert in only ten minutes! Empty the raspberries, lemon juice and agave nectar into your Vita-Mix or blender. Blend on high speed until smooth (you really do want it smooth because of the raspberry seeds). If you prefer your sorbet on the softer side, either blend a bit longer, or leave raspberries out a few minutes (but only a few!) before blending. Delicious with Deep Dark Delicious Raw Chocolate Sauce.